After breakfast we set off to see a lacquer ware factory. The lacquer ware was fantastically beautiful. 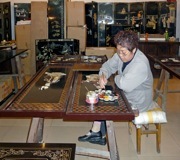 We watched as the artisans designed and arranged pieces of inlay and gilt to go into the furniture. They also had some tie-dyed scarves that I couldn't resist buying. Ancient Chinese furniture has a fine reputation in modern China and the West alike, Chinese ancient furniture features profound cultural facts and superb craftsmanship. The furniture was mostly made from precious wood in the jg (1368 1644) and QJg (1616 1911) dynasties. It is widely recognized as the best, because furniture before the Ming Dynasty did not survive wars and time, traditional Chinese furniture craftsmanship did not reach its zenith until the Ming Dynasty. Demand for fine furniture greatly increased due to prosperity of cities and development of the economy and growing marine trade, precious timber could be more easily obtained from southern China and Southeast Asia. It reached a high level of aesthetic success and could even claim a place in the history of world furniture. Chinese furniture was usually lacquered red or black and then painted, and often carved and sometimes inlaid with other materials such as precious stones, etc. Ming furniture is known for its simplicity with sparse lines and little decoration while Qing furniture emphasizes details and extravagance. Furniture from southern China tends to be very elaborate whereas northern furniture is big, heavy and grand. Ming Dynasty Furniture Ming furniture is simple with sparse lines and little decoration. It usually features fine and durable precious woods, such as mahogany, sandalwood, rose wood etc. 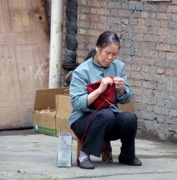 In the Ming Dynasty, the demand for fine furniture, the ample supply of wood and the highly developed tenon mortise technology all facilitated the success of the Ming furniture. Craftsmen of the Ming Dynasty used the succinct language of art to express their inner feelings, and combined ingeniously with the beauty of simplicity and quietness. So the Ming furniture usually has simple structures, unique shapes and minimal decorations, which would reserve the natural beauty of the wood. Lines were ingeniously applied to emphasize details such as the back of an armchair and the legs and resting bars of chairs and tables. Main emphasis was placed on the application of the natural beauty of the wood texture and adopting latticework and openwork carving. On eye striking places such as the backs of armchairs, there would be simple patterns by relief engraving or openwork carving. Qinci Dynasty Furniture In the early Qing Dynasty, furniture inherited characteristics of the Ming Dynasty, from the reign of Emperor Yongzheng to Emperor Jiaqing. After political power was stabilized and the economy improved, people began to pay more attention to more material things in their lives, and demanded decorative and luxurious furnishings, gaudiness and sumptuousness were a basic features of Qing furniture which was usually heavy and sizable, featuring exquisitely carved patterns. Some pieces were carved from head to foot and had inlays of stone, mother of pearl, porcelain, metal, or enamel. Qing furniture had curved decorations and exaggerated shapes that demanded attention. In the late Qing Dynasty, antique Chinese furniture waned. From there we went to the Small Wild Goose Pagoda. It is one of the oldest pagodas in China, and is housed in the Jianfu Temple. At the pagoda they were having a showing of modern folkloric paintings that were quite beautiful. I wish I had bought some, but the photos will have to suffice. The pagoda was built from 707 to 709 A.D. and housed Buddhist scriptures brought back from India by another pilgrim. The top of the pagoda was shaken off by an earthquake in the middle of the 16th century, but the rest of the structure is intact. Small White Goose Pagoda, Xi'an: contemporary folk art show Then we went to a yummy dumpling lunch. Moslem Market in Xi'an From there, we went to Xi'an's Ming Dynasty 14th-century City Wall. That afternoon we flew from the dry northwestern plateau of Xian to the moist, semi-tropical mountainous region of Guilin. We were met at the airport with a scene of gaudy neon palm trees that loked like something you'd see in Disneyland or in touristy parts of Florida. We checked into our hotel, the Guilin Royal Garden Hotel, and had dinner at a local restaurant.